So much talking, a lot of visiting, a whole bunch of driving, some attempts at surfing, campfires and sleeping bags, and a glorious stack of magazines. I had grand plans for this stack. Some beach time, during naps in the car, quiet mornings in the woods. Beach time involved cheering on the girls at surf lessons and my own half-assed (or should I say double assed?) attempts while keeping the Garbage Truck from eating too much sand or discarded mussel shells. Naps in the car were great, but the roads in British Columbia are very, very windy and not conducive to reading. Quiet mornings in the woods? Nope, not at all when camping with 3 kids. But I did get one afternoon by the fire on a lazy day and a straight stretch of a main highway in the day light. 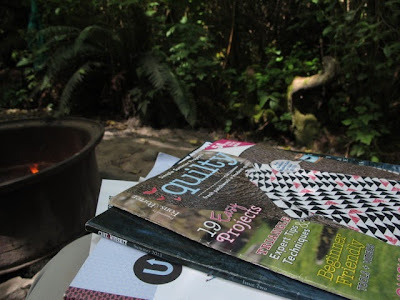 Quilty - so many fun quilts in this issue. Lots of inspiration. Cake &Whiskey - inspiring stuff for any of us working, running businesses, and living a life beyond school pick ups. Uppercase - wildly rich in visuals and ideas. Sometime next year I will read another magazine. I hope you had fun, even without the reading time. Eventually they get bigger and you can read your book while they read theirs. A lot of us have been where you are now. And it doesn't last forever. You'll have reading time again. My kids are young adults who come and go at all hours. I think having children is just one adjustment after another! I do believe I may have to check out Uppercase though. I envy anyone who can read or do handwork in a moving vehicle. I start to get carsick as soon as I put my head down to focus on something, lol! Sounds like you had a good time all in all. Cake & Whiskey looks awesome! I hadn't seen that yet. Thanks for the rec!